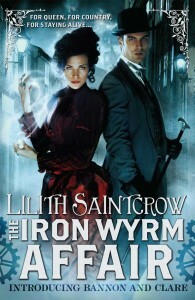 Lilith Saintcrow launches a new steampunk series this August with THE IRON WYRM AFFAIR (US | UK | AUS). Adventure and intrigue lie in wait for detective duo Bannon and Clare as they try to unravel the mystery behind a string of murders targeting London’s geniuses. You can read the first chapter here and get a sense of Emma Bannon’s sharp wit. This novel is a ton of fun so we thought: what could be more fun than bringing two charming ladies like Gail Carriger and Lilith Saintcrow together to introduce this new novel? Read on to find out several fun and interesting facts about Lilith and THE IRON WYRM AFFAIR and find out which character(s) Lilith would most like to slap. Gail: Tea or coffee and how do you take it? Lilith: Yes to both. Coffee I take as espresso with a little heavy cream, tea I take mostly with gingersnaps. But there’s nothing like a cuppa when the day’s going dreadfully. Gail: Describe your personal style for author appearances. Lilith: You mean other than the perfume of complete terror? I have dreadful social anxiety. Normally I’m in jeans, a T-shirt with no holes, boots, and eyeliner. I agonize over appearances, they’re nerve-wracking. I have to wear something I can run in if the zombie apocalypse occurs. Gail: If I were to observe the writer beast in its native environment, what surprising thing might I see? What does the environment look like? Lilith: A tall glass of water with a squirt of Key Lime juice in it. That’s my preferred drink while writing. Also, a statue of Ganesh the Remover of Obstacles as writer right next to my computer, and on the other side a bonsai tree. It used to be the Saddest Little Bonsai In All The World, because the cat wanted to chew on it, and on my desk is the one place the cat can’t get to it. So the bonsai is recovering now. Also, there are a bunch of 3×5 notecards with different notes and page numbers on them, and a Keep Calm and Carry On paperweight. Gail: If you drive, what do you drive? Lilith: A Subaru. All wheel drive is a must if the infrastructure goes down. Lilith: Chocolate on a plain cone. As for my level of sanity, well, I’m a writer. Sanity rarely applies. Gail: What’s most likely to make you laugh? Lilith: A delicious juxtaposition of words. Gail: Since writers inevitably end up in the bar, what’s your poison? Lilith: Dry red wine. I can’t drink white—it tastes wrong; and I can’t drink beer because of the yeast taste. My poison used to be vodka, but I’m no longer that young. I’m a big fan of syrahs if they’re not too sweet, and pinot noirs. Gail: What should readers eat while consuming your novel? Lilith: Several courses of a Victorian dinner. There’s one particular dinner within Iron Wyrm that’s very important; food in my books always serves a number of purposes. Mostly because I love food, and memories of important occasions for me often seem to revolve around what was being eaten. Gail: What form does evil take within its pages? Lilith: There’s not a lot of evil per se. There’s certainly a lot of ambition; I suppose ambition can be evil if enough of it builds up, just like anything else. There’s also the fact that certain people in Iron Wyrm don’t particularly care who they have to hurt to get a job done; it’s very easy for those people to do terrible things in service to what they believe is right. Gail: Which one of your characters would you most want to kiss and why? Lilith: In Iron Wyrm? Probably a secondary character—Sigmund Baerbarth. He’s the closest there is to comic relief in the book, and he’s incredibly loyal and lovable. If it’s all my books…hmm. Probably Hutch from the Kismet novels. He’s just so adorable. And brave. Gail: What’s your favorite period in history and does it influence your world building? Lilith: I have several periods I’m interested in—the French Revolution, the Eastern Front in WWII, Russia right before the 1918 Revolution, the Roman Republic, Byzantium’s entire historical arc. History, to me, is a vast cornucopia of things that will feed one’s work. I love research, one of the great things about writing this current series is that it allows me to study the Victorian era, which really wasn’t one of my favourites but is quite fascinating. Anything is fascinating if one pays close enough attention, though. And no knowledge is ever wasted. Gail: Which one of your characters would you most like to slap and why? Lilith: Oh, all of them. You can’t have a good character without wanting to slap them. 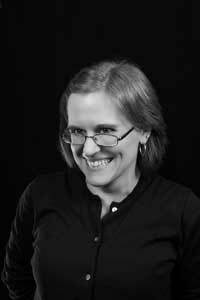 Gail: Without spoilers, what’s the funnest (or funniest) part of book? Lilith: Probably Sigmund Baerbarth moaning about his Spinne. It’s a recurring joke in the series, and it always makes me giggle. Plus, he can’t find his wurst. Gail: If your story smelled of something, what would that be? Lilith: Well, Victorian London didn’t smell very good. So probably smoke, rot, Emma Bannon’s brunette perfume, which includes bergamot and musk, horse, leather, blood, and roast meat. Not very appetizing, but certainly distinctive.